Are You Presenting Relevant B2B Marketing KPIs to Your Board? At the heart of every effective marketing campaign are its KPIs. Why are KPIs so important? Nowadays, marketing is all about accountability. As CMOs increasingly come under pressure to account for exactly how their activities contribute to furthering business objectives, reporting becomes a crucial concern. In addition, KPIs act as an anchor to remind you of your big-picture goals so you don’t lose track of your company’s business objectives. Once your campaign comes to an end, your KPIs serve as a benchmark to inform you of how well you’ve done (and how much room is there for improvement). Howard Diamond, Senior Vice President of Digital Strategy at Rise Interactive argues that no single metric “tells a complete story”. Regardless of whether you’re reporting your KPIs to your board, or communicating these to your junior staff, be sure to keep the big picture in mind- if you simply isolate a few KPIs to review, these may be misleading. When setting your KPIs for reporting, make sure to keep quarterly, bi-annual, and annual business goals in mind. The connection between goals and KPIs should be crystal clear to everyone involved. As Steve Bernstein, Senior Director of Data and Analytics at StubHub suggests that organizations must agree upon and employ company wide metrics and KPIs in order to ensure accurate data analysis. For example, sales and marketing teams need to be on the same page where KPIs are concerned. Setting up agreed standards will minimize conflicts down the road. So clarify what your campaign goals are, how many MQLs or opportunities you are aiming for, what constitutes a qualified lead and what the process is for following up on those campaign leads. The last thing you want is for your sales team to not follow up on leads generated due to a “quality” definition. Expert Tip: As you’re setting your KPIs, sit down with your sales team to set clear parameters as to what qualifies as lead, MQL and SQL. What marketing KPIs should you keep track of? Since KPIs are derived from business objectives, each company will have its own set of KPIs to track. But to get you started, here are some of the basic KPIs which most CMOs would want to keep an eye on. Why: These figures will help you identify the bottlenecks in your marketing funnel (and also give you some ideas as to how to fix it). KPIs are essential for this kind of detective work. For example, if you don’t have enough non-qualified leads flowing in, your website might not be properly optimized - which deters organic traffic from reaching out to you. If you don’t have enough MQLs, the ads you’re running might be too generic, bringing you low quality and non-qualified leads. If you don’t have enough SQLs, marketing objectives might not be well aligned with the sales team. Why: You’ll want to look at conversion rates to see how well your marketing efforts are performing. 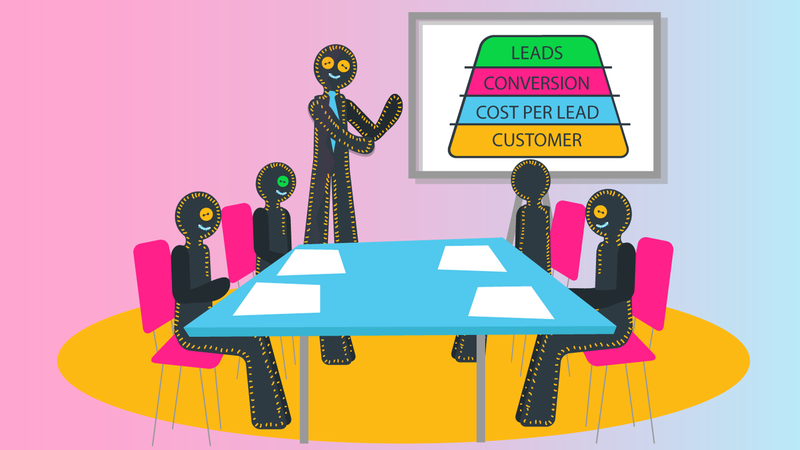 When faced with an overarching problem of consistently missing sales targets, marketing and sales teams often start pointing fingers at each other - but if you have specific data on your leads to MQL conversion rates, as well as your MQL to SQL conversion rates, you can better evaluate the problem area. Why: Looking at the number of MQLs and SQLs only tells us a part of the story. In order to see how effectively your marketing campaigns are performing, consider the cost per MQL and SQL as well. If this cost is rapidly increasing each quarter you may need to divert or increase budgets. Calculating the customer lifetime value is also important in the decision process of how much to invest per SQL BUT that’s a different report. Why: This ratio measures what percentage of your new customers signed up thanks to your marketing efforts. If the bigger chunk of your customers are coming in because of your marketing efforts (instead of sales! ), that is great news for every CMO. If the number is unreasonably low, it is time to revise your strategy from the ground up. Why: This percentage is pretty similar to the one above, but it casts a wider net to demonstrate all customers whose decision to buy was influenced by marketing at some stage in the buyer's’ journey (not just customers who originated from marketing). If it seems that your sales team always outperforms your department, tracking this KPI may give you some breathing room during the board meetings by providing an actual proof that marketing are indirectly assisting sales in closing those leads. Leads converted through email nurturing, no matter where the lead originated, is just one example of marketing influenced customers. Let’s say you offer cyber security services, and your sales team reached out to an enterprise company. If the account has signed up to your service only after attending a conference organized by marketing department, or an email campaign, this customer counts as “influenced by marketing”. When reporting your KPIs to your board, always supplement the raw numbers with insights and strategies to improve your current approach and tactics. Run through what strategies were particularly effective in the context of the overall business objectives, and which ones didn’t work as well. Talk about what your team has learned from these numbers, as well as the changes you are planning to implement going forward. Expert tip: When reporting these KPIs to your board, always prioritize insights and the impact on the bottom line. There are many more KPIs you might want to track, but these are an absolute must to any startup CMO. Do you agree? Let us know in the comments below! Lior is one of our Inbound Marketing Managers, a true Scot at heart who loves helping nurture new businesses. She's in love with her dog Mac, who you can find on Facebook AND Instagram. She's your gal for everything crime fiction novels.